Aubrey Plaza, Mark Duplass, and Jake M. Johnson star in a film written by Derek Connolly and directed by Colin Trevorrow. As the constantly disapproving Julie in Scott Pilgrim vs. the World, Aubrey Plaza got to show off her considerable talent of building sympathy for a disagreeable character. She mainly bitched at Scott, setting herself up as the final arbiter of relationship morality, though her sudden role switch into mystically powerful Envy Adams’s toady made her vulnerably likeable. 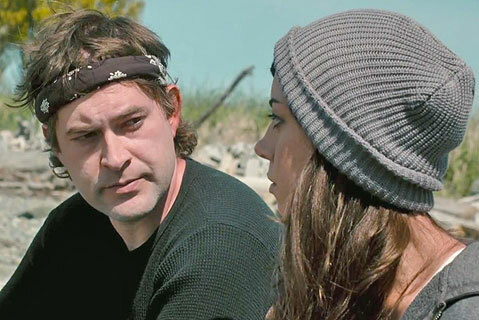 In Safety Not Guaranteed, which Plaza’s charisma carries, she doubles down again; sometimes she’s an idealistic cub reporter, sometimes a slimy manipulator. It serves the movie well because we need to both believe and doubt the premise: that some crackpot Seattle loner (Mark Duplass) has conquered time and can return to lost yesterdays. Otherwise, the charms of this relationship-regret movie would seem mundane. Plaza has intense, eyeliner-rimmed goggling eyes, which manage to imply some traumatizing past for her character Darius. Funny thing is hers is the only tragic background we don’t learn. An intern at a Seattle city magazine, Darius volunteers to help sardonic veteran reporter Jeff (Jake M. Johnson) investigate a weird personal ad promising time travel (though Jeff has ulterior motives involving an ex-girlfriend). They also bring along Arnau (Karan Soni), a stereotypically nerdy Indian — virginal and, therefore, without a past. Darius alone makes contact with the time traveler, woos him, and becomes torn between exposing him while hoping he can come up with some temporal disruption. Meanwhile, men in black seem to be following our mystery weirdo’s every move. You can tell that time travel has become a snazzy metaphor (much like vampires and zombies have recently) just by its showing up in low-budget films. Safety has the added factor of being based on an actual ad and ensuing meme craze, though with obvious fictional liberties added. But this is merely a sweet film. Men in Black 3 has more profound observations on revisiting the past, though this movie has Aubrey Plaza, which is enough to make even skeptics happy.